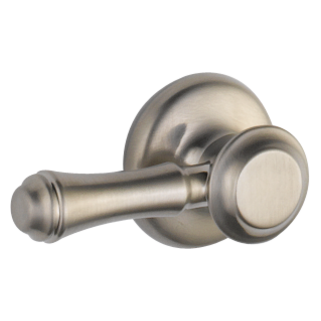 598LF-SSMPU is rated 4.5 out of 5 by 20. Rated 4 out of 5 by Krell from Unique look The open trough design is a unique look that complemented our bathroom remodel featuring weathered board wallpaper, a dune border, a sandy counter top and a driftwood vanity. A major failing is the length of the horizontal rod for the pop up drain, a meager 6". The sink I chose was a deep flat bottomed oval and really required a 12" rod. I made two calls to Delta to obtain a longer rod. Call one resulted in a 12" rod for an entirely different product and call 2 caused another 6" rod to appear <sigh>. I cut the 12" rod and used duct tape and zip ties to attach it to the 6" rod to cleanly reach the pull up. 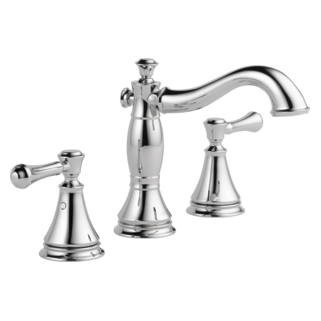 Rated 5 out of 5 by Don from Attention Getter We purchased 3 of these faucets for the master and guest bath during a recent remod project They operate to our full satisfaction and look beautiful with the new granite countertops. My only concern is how well the finish inside the trough area will hold up but time will tell on that. Not too concerned however because of Delta's solid reputation on standing behind their products. Rated 5 out of 5 by alyson916 from Beautiful! 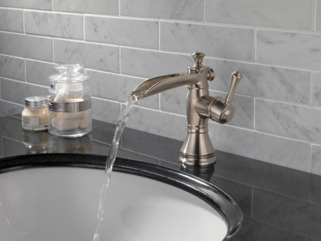 We had this faucet installed in a half bath and its absolutely beautiful! We've received many complements on it. Rated 5 out of 5 by BMostofo from Classic! Bought this in chrome, looks beautiful, works great. Happy all of with the Cassidy Collection I purchased for my bathroom. Rated 5 out of 5 by tauneutrino from Great Investment Looks fantastic with the new vanity cabinet as part of our bathroom remodel. 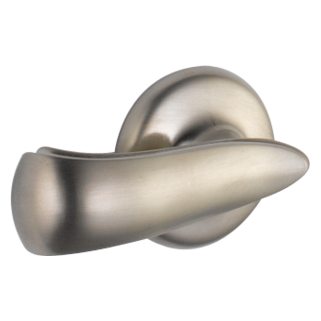 Really like the brushed stainless steel finish. Rated 4 out of 5 by Ray from Nice design I purchased this faucet several months ago and have had no issues with it. I like the style and overall design. If I had a complaint it would be with the drain. The one it comes with will only work on a sink with an overflow. It will not work with any type of vessel, glass, or stone sink. This added expense and a hard time matching the finish. Do you have a template for this sink? I need to give my granite guys a template for them to make a cut out to install the sink. Do you have one? Hoping you can mail me one.? Thank you! I have a kitchen sink faucet with a similar set up, the handle off to the side. I was able to install it with the handle on either side. 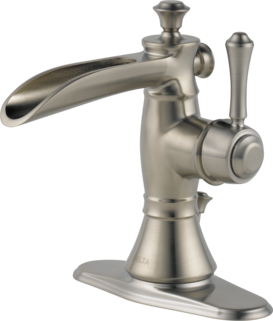 Is it possible to install the Cassidy single hole - single handle channel spout faucet with the handle on either side? It would be very helpful if it were. It seemed as though there was a picture on your site that showed it the other way but that just may be a reversed image. 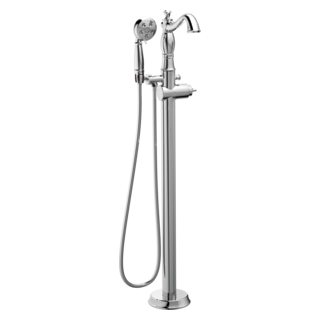 Additionally, is there a ceiling mounted rain shower haead and mixer valve that accompanies the Cassidy single hole faucet? Thank you for your time and prompt response. Thank you for your question. 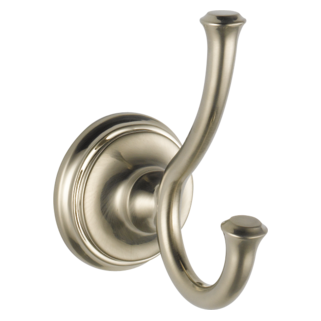 Delta Faucet model # 589LF-MPU can have the handle on either side. Just remember that if you put the handle on the left side, then the hot and cold will be reversed. 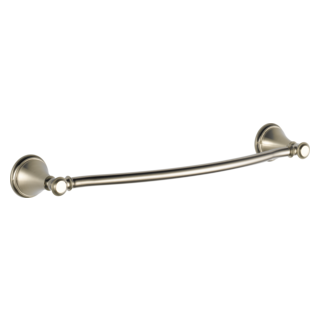 Regarding the ceiling mounted showerhead and trim, I would recommend Delta Faucet model # R10000-UNBXHF rough-in valve with the T17097 valve trim. 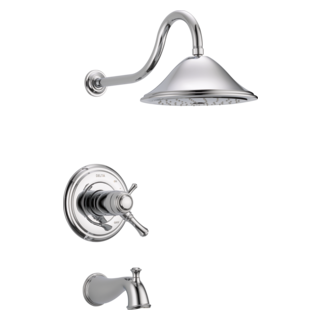 The raincan showerhead is model # RP72568 and the shower arm and flange is either RP61058(6 inches) or U4999(9 inches). 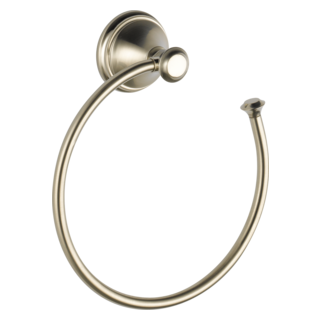 Alternative plate installation for Cassidy Single Hole - Single Handle Channel Spout Faucet? I have a bath counter configured with 3 holes and the 2 outer holes are 8&quot; apart. I know this bath faucet comes only with a 4&quot; plate which will not cover the outside holes. However if I purchase separately RP71545 (the plate for the Cassidy Single Handle Pull Down Kitchen Sink Faucet), will it work with this bath faucet to cover the outer holes? Thank you for your question. Delta Faucet model # RP71545 is not compatible with the 598LF-RBMPU. We recommend that you add a couple of soap dispeners and use one for soap and one for lotion. 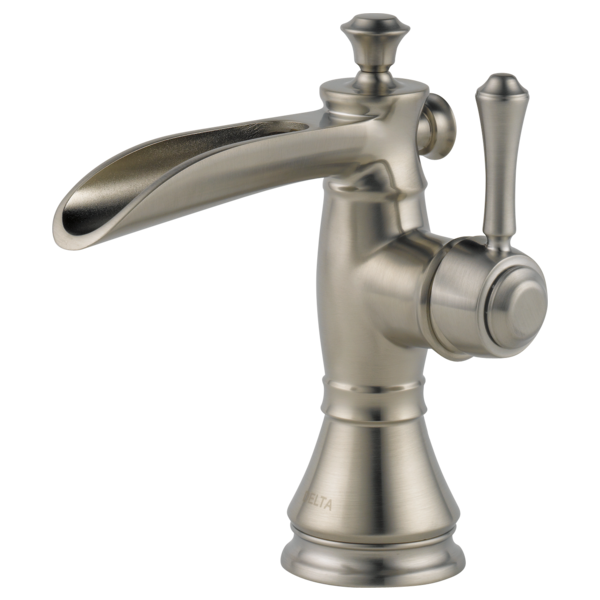 We recommend Delta Faucet model # RP37039RB. how far out does the water pour from the channel spout? 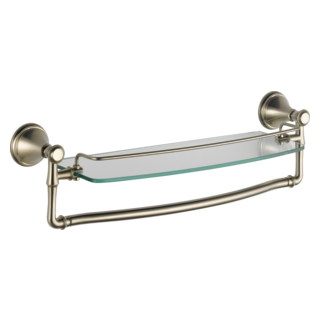 We are looking to buy this faucet to accompany the Duravit 1930's pedestal sink which is on 16 3/4&quot; deep from the wall and the basin itself is only 10&quot; front to back. I'm wondering if this faucet will work with the Duravit sink without spilling and splashing all over? we recently purchased a 598LF-MPU faucet, the drain is for an over flow sink and ours is not. Can I get the top screw lip on top for a non overflow sink ? Can I use this Delta Cassidy single hole channel spout on an IKEA sink that comes with an IKEA Godmorgen sink cabinet with 2 drawers? I need a grid flange for a single wall sink. 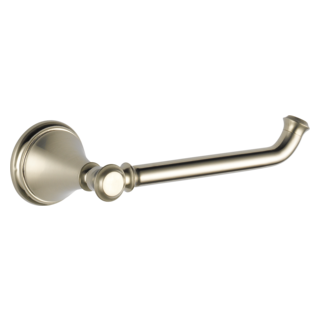 I Have the Venetian Bronze finish, do you have that option?